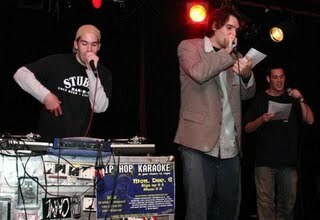 Hip Hop Karaoke NYC :: Blog: HHK 5-Year Anniversary Tonight! Tonight is the last chance to try for a shot at the Hip Hop Karaoke Championship. Read the rules, brush up on your tracks, and come through to Mercury Lounge. Doors @ 8, sign-up from 9-10, show at 10. Don't forget the flyer to save some loot. for me, one of my fav moments ever was tara absolutely destroying brooklyn zoo. up until that point, it was one of the first times a female had really, truly, wrecked the stage at hhk. i was very proud to be there for it. shout out to tara and rare form. ya'll helped make hhk, for sure. • "Shoop" at Governor's Island. Don't know dude's name, but it was devastating. • Dres leading the whole pack of us in "The Choice Is Yours" at the Highline. That was one of those "I can't believe this is happening" moments. Hey, is there a video anywhere of that "Run" performance? 1. Being part of the opening song, "Protect Ya Neck." 2. Randomly meeting Charlie K., figuring out we had like 2 degrees of separation, then ripping "Jump Around" together. 3. Serenading Fallon to "The Way You Move." I think I've mentioned this before but I remember the night two HHK legends were made, when K-Dot performed his signature song, "Give Me Some More," the Doni D followed it up with "Luchini." I think everyone know my personal all time favorite.. it's on youtube.. When Kane came out.. Good lord I lost it. The dude on Gov. Island who did Shoop was Insain!! Can't forget the time Uncle Ralph promised to shoot me in the face. sorry i missed last night. i second kev on his number 2 - good times. i can't remember her name but at rothko a girl destroyed shimmy shimmy ya and the place sounded like a 747 when she finished. loudest crowd reaction i've ever witnessed at an hkk - at any venue. That kid that did "Slam" last night, killed it. That's what hip hop is all about man- the fans. We buy the music, we live the music man. My first HHK. . . Diggedy opened with "I Got it Made" and for the rest of the night I acted a fool with a bunch of strangers, who instantly became family, in a packed Knitting Factory. Last song of the night. . . some dude did a backflip off the stage, landed on some girl in the first row. . . got up and ran straight out the front door never to be seen again. I didn't stop talking about HHK for weeks, and I've been adicted ever since.